From the Musical Porgy and Bess. 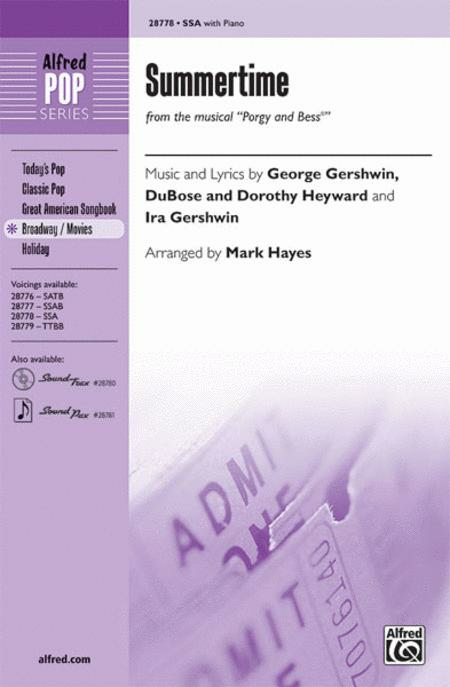 Composed by George Gershwin (1898-1937), DuBose, Dorothy Heyward, and Ira Gershwin. Arranged by Mark Hayes. Masterworks; Performance Music Ensemble; Single Titles; Tony. Alfred Pop Choral Series. 20th Century; Broadway; Masterwork Arrangement; Secular; Standard. Choral Octavo. 12 pages. Alfred Music #00-28778. Published by Alfred Music (AP.28778). This classic American song from Porgy and Bess deserves only the finest choral treatment, and Mark Hayes has certainly given it that, with a rich, lush setting. The piano accompaniment carries the voices on a dramatic journey appropriate to the nature of the piece. A song that every singer should know and will love. Loved the harmony. The rhythm is a bit tricky in the midsection as each part is moving at different times. The Soprano I part goes to a high A. The ladies in the choir enjoyed the glissandos--they are legal in this piece. Would recommend it. 31 of 55 people found this review helpful. July 30, 2008 nice but tricky in parts!